In the world of portable gas grills, Weber is king. The Weber Q100 and Q120 are the two models that should interest you in the sub-$200 price bracket. Let’s see what the differences are and which one you should get. PLEASE NOTE: Both these models have now been replaced by new versions, but the key differences are still the same. The Q120 features two folding work tables. This is a great extra feature to have over the Q100 because, quite frankly, we need these things. Since this is a portable unit they are particularly significant as work space may be well be non-existent on the beach or in the woods, or wherever you may find yourself. Since they fold away, it doesn’t add to the carry size of the product. Great feature. The Q100 doesn’t have one, the Q120 does. How useful this is will depend on the way you cook, but for most this addition alone is worth the extra cost of the Q120. The Q120 features an electronic ignition, ensuring first time ignition every time. The Q100 has a push button starter. 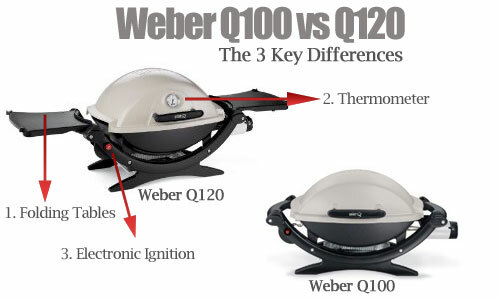 The Weber Q100 typically costs around $30 less than the Weber Q120. That’s $30 extra for the very handy folding tables, the thermometer and the electronic ignition. Worth it? Heck yes. The convenience of the folding tables will more than make up for that $30 or so over time. So, that was the Weber Q100 vs Q120. It’s the Q120 all the way for us, and we’d advise you to pick it up as well. You can always trust Amazon for an excellent discounted price. Remember, they are now called the Q1000 and Q1200. If you are looking for something bigger and more powerful, try the Weber Q3200.